BRATISLAVA (Reuters) – A man charged with Slovak journalist Jan Kuciak’s murder has confessed to shooting him, Slovak public television RTVS and the aktualne.sk news website reported on Thursday, quoting police sources. 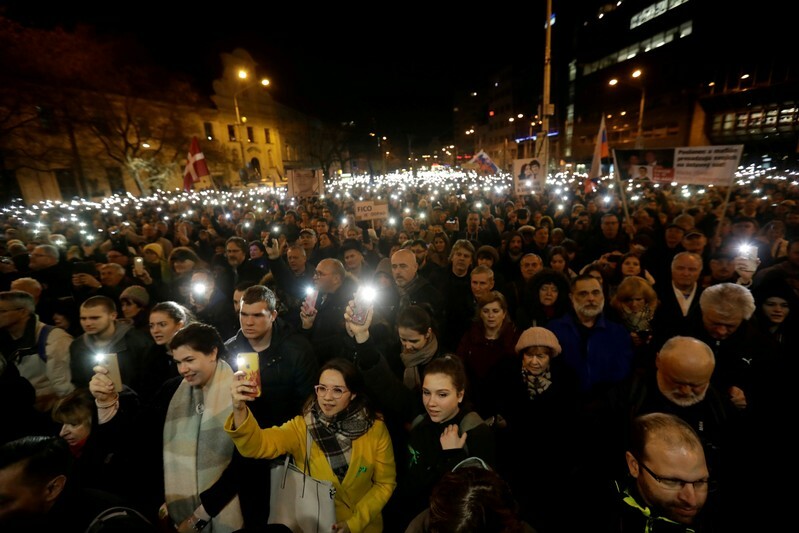 The killing last year of Kuciak, a reporter covering corruption, and his fiancee, Martina Kusnirova, sparked massive protests that led to the resignation of the prime minister, Robert Fico. BRATISLAVA, Slovakia – Slovakia’s Supreme Court is deciding whether to ban a parliamentary party for the first time in the country’s history. BRATISLAVA (Reuters) – Slovakia’s outgoing president said on Wednesday he would form a new political party when his term expires in June, aiming to unite the country’s liberal, pro-European Union camps. Andrej Kiska had not run for re-election but endorsed the eventual winner, Zuzana Caputova. A civic campaigner and anti-graft lawyer, her landslide victory last weekend encouraged the pro-EU liberals Kiska hopes to lead. The Slovakian presidency is largely ceremonial, but Kiska made it an influential office. He sided with protesters who mounted massive demonstrations after the killing last year of Jan Kuciak, a reporter covering corruption, and his fiancee, Martina Kusnirova. The protests led to the resignation of Robert Fico as prime minister. Fico’s ruling party, Smer, saw its support plunge after Kuciak’s and Kusnirova’s murders. Political analysts said it was not clear whether Kiska, the country’s most trusted politician, with an approval rating of 57 percent, can unify the disparate opposition or will further fragment the centrist pro-EU, anti-graft camp. An AKO agency poll of 1,000 people last month showed 9 percent of voters would certainly and 31 percent would probably vote for his party if he set one up. Its natural allies, Caputova’s Progressive Slovakia, which runs on a joint slate with Spolu (Together) party, saw their joint support double since February to 14.4 percent. Caputova will quit her party in the coming days in a nod to a tradition that the president is non-partisan. The leftist but socially conservative Smer saw its support fall under 20 percent for the first time in more than a decade. Support for anti-European, far-right People’s Party-Our Slovakia rose to 11.5 percent in April from 9.5 percent in February. 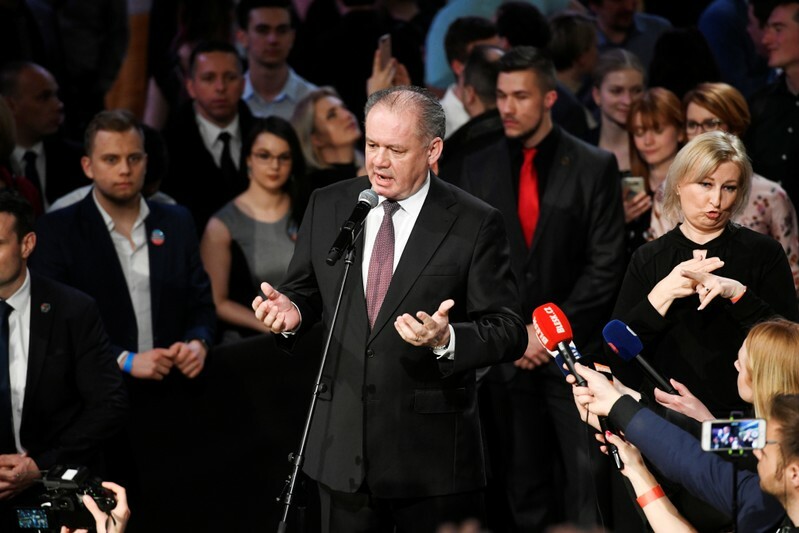 BRATISLAVA, Slovakia – Slovakia’s outgoing president, Andrej Kiska, says he’s planning to create a new political party once his term in office expires in June. Kiska, a successful businessman-turned-philanthropist, did not stand for a second five-year term in the largely ceremonial post. Liberal environment activist Zuzana Caputova was elected Saturday to the post as the country’s first female president. In Wednesday’s announcement, Kiska didn’t immediately offer details. His term in office was marked by clashes with populist former prime minister Robert Fico and his leftist party, a dominant political force that was tarnished by corruption scandals. Kiska supported huge street protests that led to the fall of Fico’s coalition government amid a political crisis triggered by the slaying last year of an investigative reporter who was investigating possible widespread government corruption. 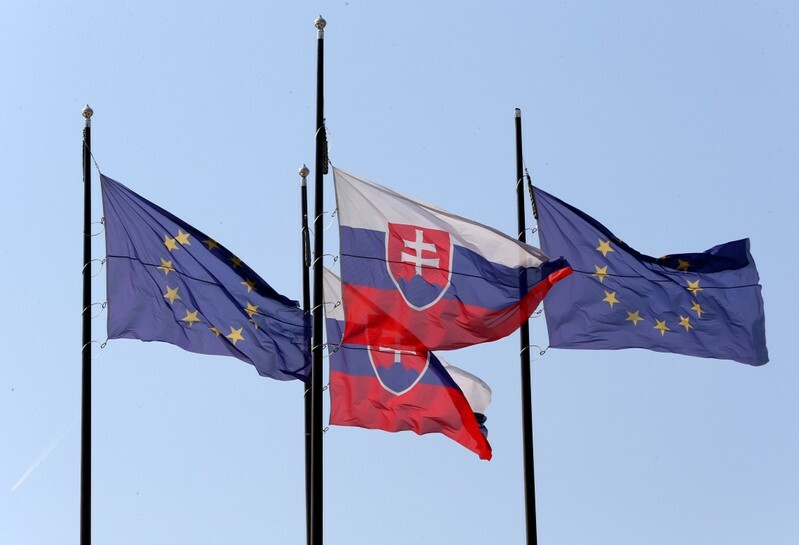 BRATISLAVA (Reuters) – The election of anti-graft lawyer Zuzana Caputova as Slovakia’s president has boosted her liberal, pro-European Union party’s prospects in EU elections, against the grain of rising populism across the continent, an opinion poll showed on Tuesday. BRUSSELS (Reuters) – The European Commission said on Tuesday it suspended a Slovak tax on the food retail sector pending the results of an in-depth investigation into whether certain exemptions from the tax gave some retailers a selective advantage over their competitors. “The Commission … issued an injunction, requiring Slovakia to suspend the application of the measure until the Commission has concluded its assessment under EU State aid rules,” the EU executive said in a statement. BRATISLAVA (Reuters) – Slovakia’s ruling party-backed candidate Maros Sefcovic conceded defeat in the euro zone country’s presidential election on Saturday. Sefcovic, a vice-president the European Union’s executive Commission, told reporters he had called his rival, liberal lawyer Zuzana Caputova, to congratulate her on her victory. BRATISLAVA, Slovakia – Voters in Slovakia are selecting a new head of state in a runoff that could give the country its first female president. Zuzana Caputova, an environmental activist, is up against European Commission vice-president Maros Sefcovic in the vote for the largely ceremonial post in the nation of 5.4 million. Caputova won the first round two week ago with 40.6 percent of the vote while Sefcovic was a distant second with 18.7 percent. Caputova attracts voters appalled by corruption and mainstream politics. Sefcovic is a career diplomat who is supported by the leftist Smer-Social Democracy party, a major force in Slovak politics. The winner will become the country’s fifth head of state since Slovakia gained independence in 1993 after Czechoslovakia split in two. Incumbent Andrej Kiska did not stand for a second term. 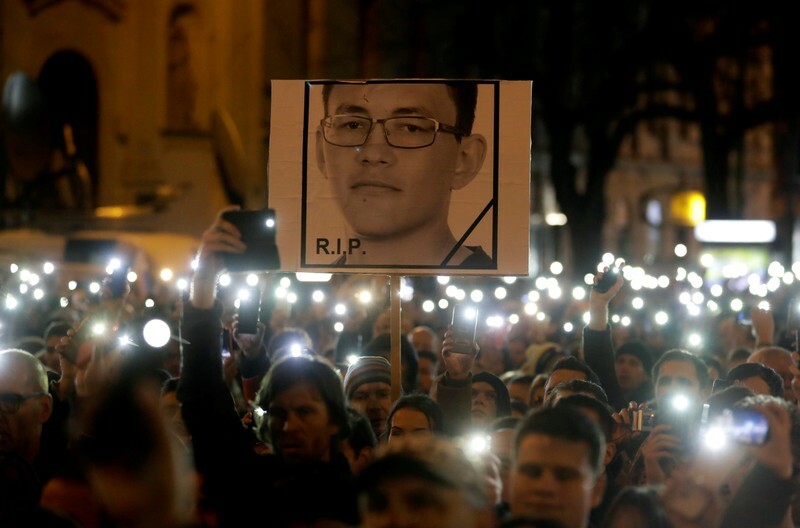 BRATISLAVA (Reuters) – A Slovak deputy general prosecutor resigned under pressure on Friday over his contacts with the main suspect in the murder of investigative journalist Jan Kuciak, the second such departure in the high-profile case. Some of the messages with the accused – politically connected businessman Marian Kocner – in which Sufliarsky discusses politics, were leaked by the media on Wednesday.